Many Saturdays I wake up feeling hungry and lazy; it’s one of those days when eating becomes the only activity I accomplish. 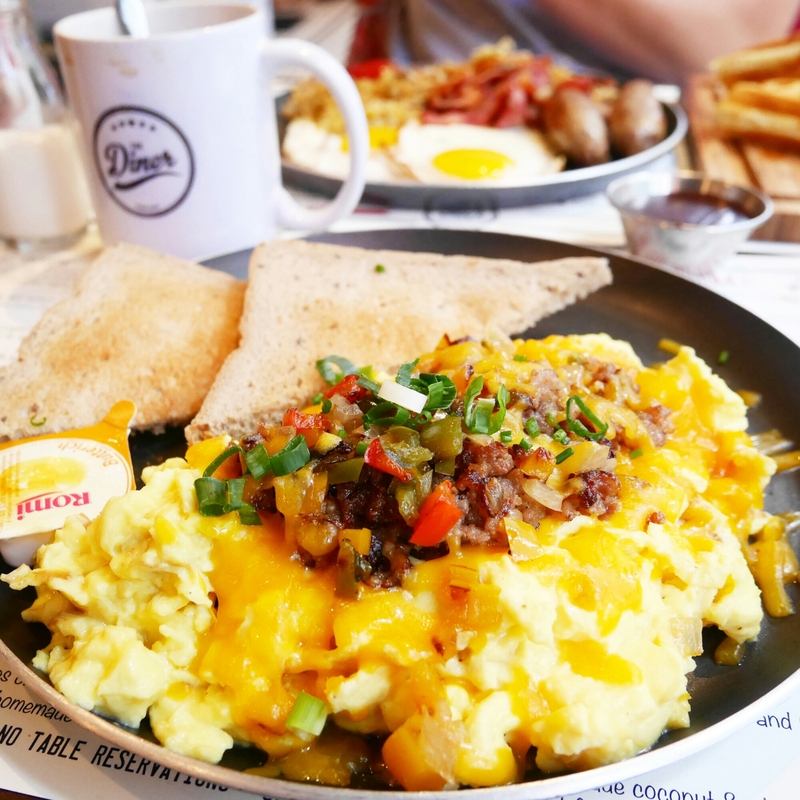 One of my favourite brunch spots has to be The Diner. There’s not much fancy to it, but it’s where I know I’ll get a satisfying (though fattening) brunch, with really good coffee and milkshake. I posted about Blue Butcher’s brunch a few months ago and labelled it the best brunch experience (in Hong Kong). That is still largely true though in a different way. Blue Butcher’s brunch serves Coffin Bay oysters and freshly made waffles at their (semi-)buffet. But it’s not the kind of place you’d get your traditional “full breakfast” at and it’s also too pricey to go have on a random weekend (I think it’s about HK$500 per person). One of the reasons I keep going back to The Diner is because they are one of very few places in Hong Kong that serve legit American-style milkshakes. 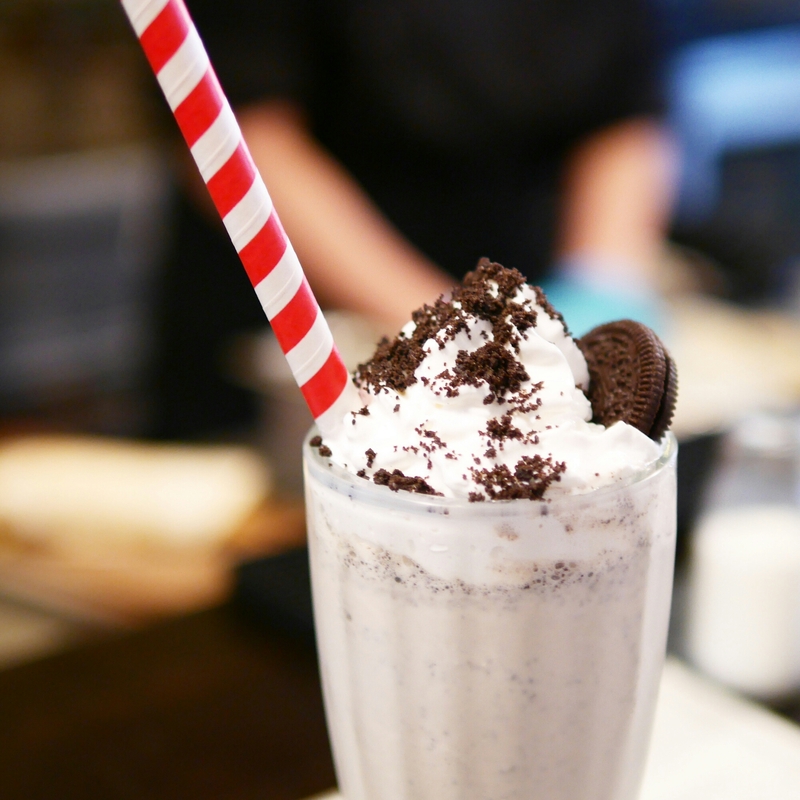 Their cookies and cream one is classic and always amazing. So I’ve ordered it every single time I’ve been here (about 5-6 times). As a side note, Main st. Deli at Langham Hotel (Tsim Sha Tsui) is another place that does a real good milkshake. The All American breakfast comes with eggs, sausages, bacon, tomatoes, potatoes, toast and a blueberry pancake. Also pictured is the bottomless brew coffee. 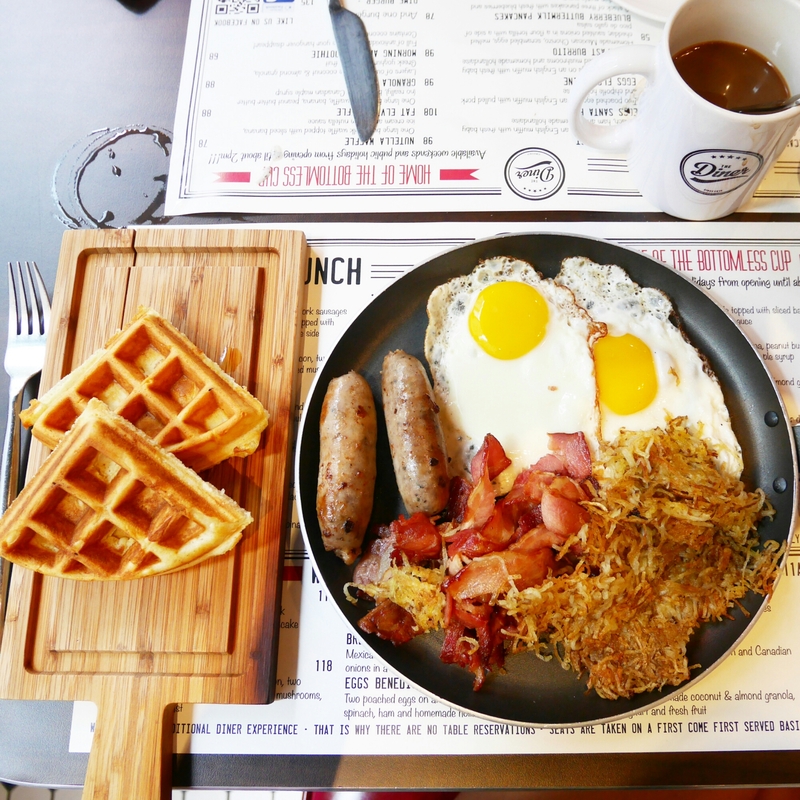 The All-American Breakfast is usually my go-to order as it has everything you could possibly want for brunch. Eggs, sausage, bacon, tomatoes, potatoes, toast and even a pancake! They also serve waffles here and one time I was craving it so badly, as you do when eating greasy food, I asked them to swap my pancake for waffles. I had to pay HK$30 extra though, so in retrospect, to say it was a rip-off trade would be an understatement. To be honest, everything here is pretty good, but the coffee is really damn good. It’s very strong and tasty. The bottomless offer is only for brunch until 2:30pm on weekends though. And it’s probably the second most significant reason I love eating here. I’m kind of boring and always order the same thing but they actually have a very extensive brunch menu including breakfast burrito, scrambled eggs, burgers, pancakes, waffles. See their full menu on their website here. The Diner also serves a variety of other items on their a la carte menu – you may have seen their epic “skirt burger”. However, they don’t serve their a la carte items during brunch hours (i.e. until 2:30pm on weekends). Anyway, although the skirt burger makes a great instagram post, the taste of the patty is only so-so. I definitely prefer their brunch times! 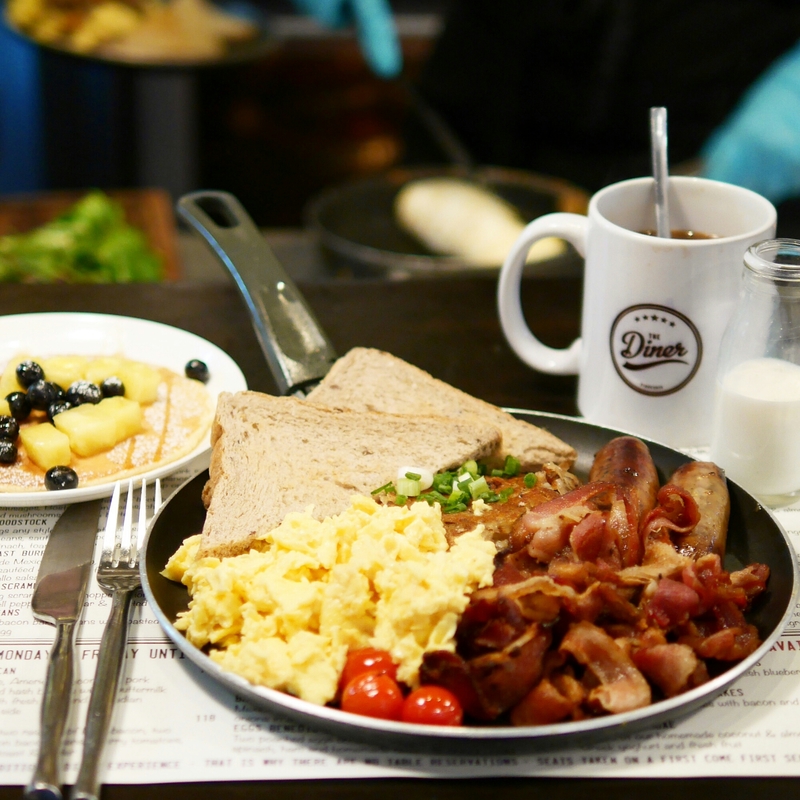 All in all, it’s simply a pretty fuss-free brunch spot with a good array of food options, great coffee and real milkshake. They don’t take reservations, but I never had to wait more than 5-10 minutes for a table during Saturday brunch times. I thought the prices were quite reasonable too. The Diner is located on 4-8 Arbuthnot Road, Central. Brunch is served until 2:30pm on weekends. Expect to spend around HK$150 per person (excluding milkshake). Check out more brunch posts here. Prev Tasmania: Where to eat the best fresh oysters?